The first thing that really must be said about Breached is that the initial play through is only going to last 2-3 hours. That's it. It's an important distinction because if I get too detailed about the plot or gameplay puzzles I will have spoiled about half of what is actually there to enjoy. There are multiple endings and different bits of story that can be revealed in subsequent play throughs, but the game remains the same for each. At the onset you quickly learn that you have been awoken from hibernation into an emergency and have only 8 days to save yourself. You are given two goals, fix the generator and synthesize fuel. 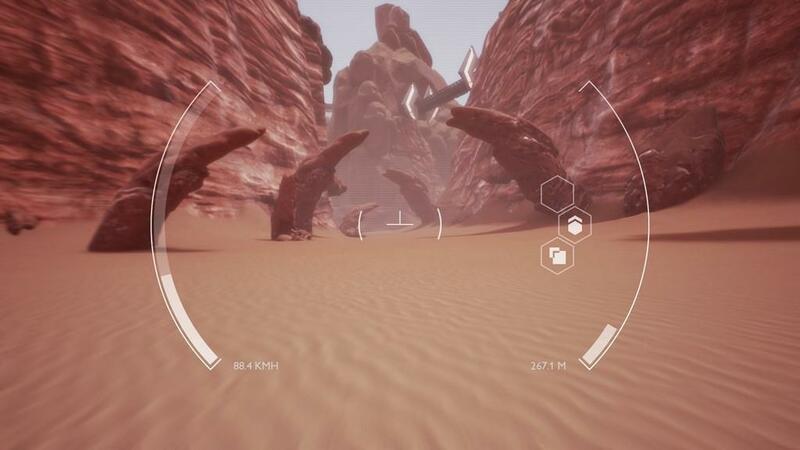 To do this you divide you time in each day between piloting drones across the surface of an abandoned planet to collect resources and manipulating those resources to satisfy your objectives. Each action ticks around 30-40% off your daily clock and then you must progress to a new day, coming ever closer to the end. 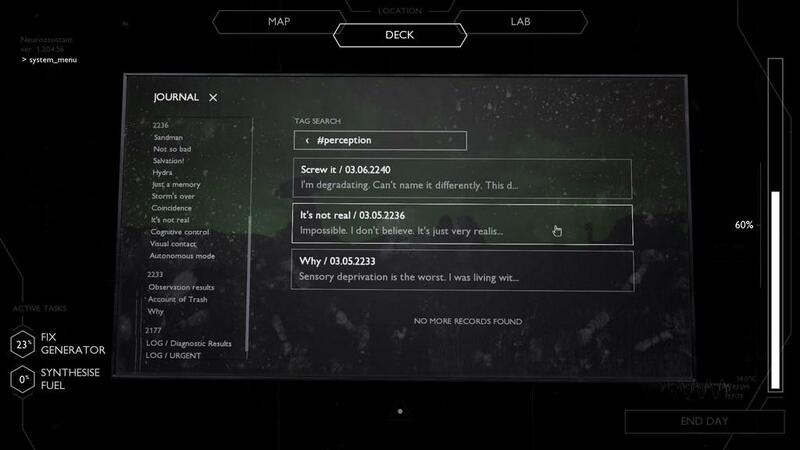 At the start of each day you face an electronic diary that you can interact with, choosing different branching paths of dialogue by way of journal entries. This is where the story unfolds, mostly about what happened that led up to this point. 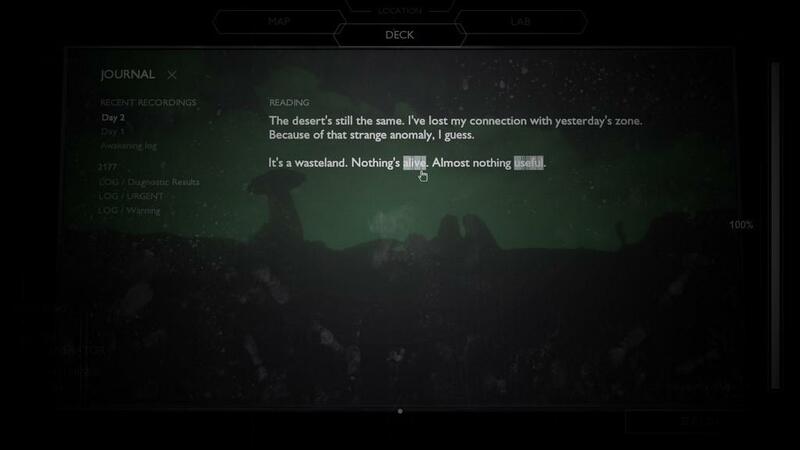 The game hints at an artfully crafted tale with mysteries to uncover, if you can get stuck in and embrace this minimalist story telling of staring at walls of on-screen text. And such was the first point of disconnect for me from Breached. The game opens on a high note, the opening sequence sets an interesting sci-fi mode and seems to promise an intelligent background. But the presentation is a choose your own adventure that does it's best to obfuscate the adventure. In an attempt to be vague and fascinating the dialog branches more often ended up simply frustrating as choosing one and hoping for a revelation only ends in a grumpy reply of "I don't want to talk about that." The result falls flat. If I had a more compelling presentation of the narrative I might have found reason to slug it out with these dead ends. I might have been brought back into the folds of the story, but to struggle against stubborn blockades only to be rewarded with more monotonous text wasn't enough for me. So for me, whatever is going on in this strange little sic-fi corner became secondary to actually getting on with the mission at hand. And that mission turned out to be pretty limited in scope. There are those two objectives, fix generator and synthesize fuel, and each has its own resource, either generator parts or fuel materials. To acquire these, you send a drone to one of three maps. There is a fourth, initial map that acts as a tutorial and introduces some strange energy force that will act as the antagonists on the remaining maps but that is never really explained (unless it was somewhere in all that text past those dead ends that I just couldn't be bothered with). 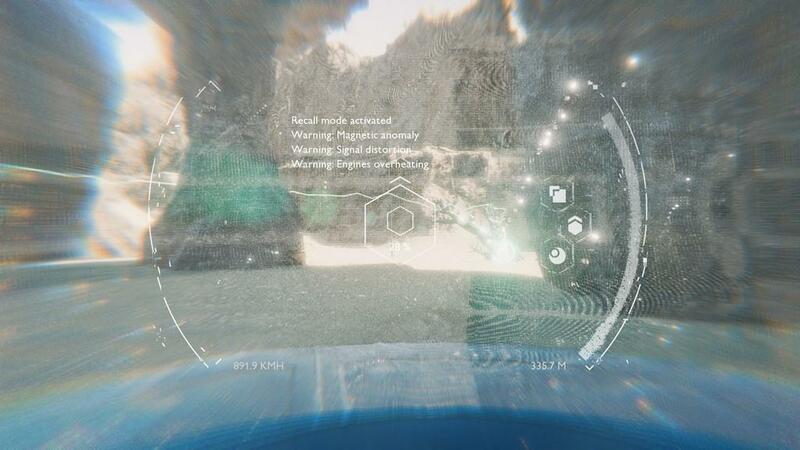 So you whiz around the maps in the first person linked to your drone and hunt down materials. 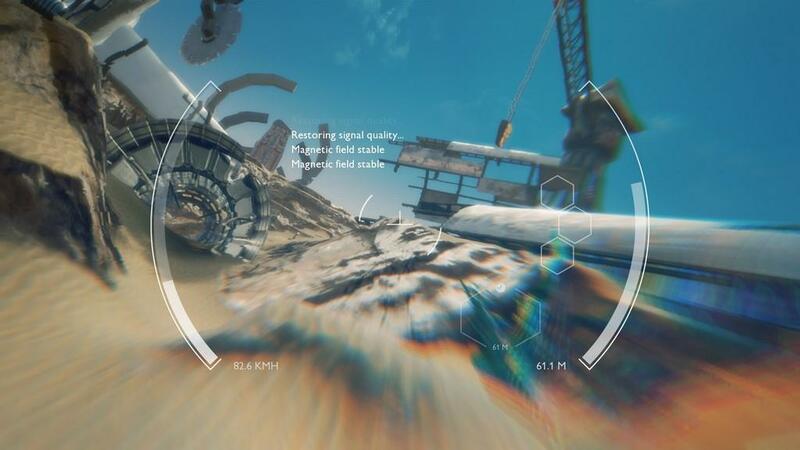 You try and avoid the energy spheres for fear of losing the drone entirely, along with all it's cargo and the precious portion of your limited time spent in the attempt. The maps are pretty and hint at a deeper story behind how they came to be abandoned, but again that's one that goes untold. 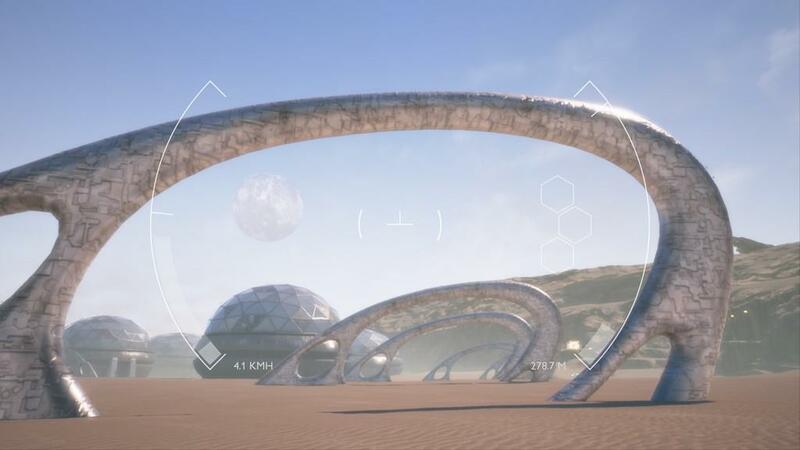 There is some decent level design in accessing areas even if there isn't much in the way of any mapping function or radar. They are large enough to provide a sense of exploration but not too large to become disoriented and hopelessly lost. 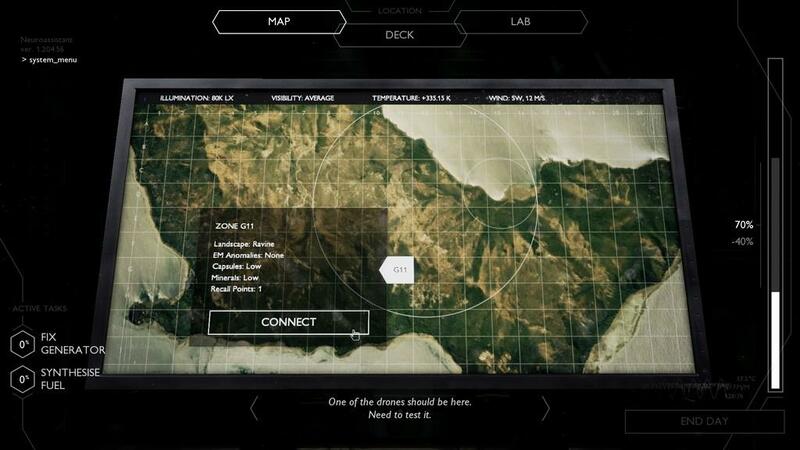 The drones are driven along the surface with the mouse and left and right clicks. One accelerates, the other brakes. There is no reverse, no ability to look in any direction other than forward, and it can be tricky to navigate tightly around obstacles in close quarters. Overall the controls are limited, but tight. It's effective enough as most of the pathways are wide enough the task becomes more one of zipping around avoiding the enemy orbs than intricately working routes through close quarters. 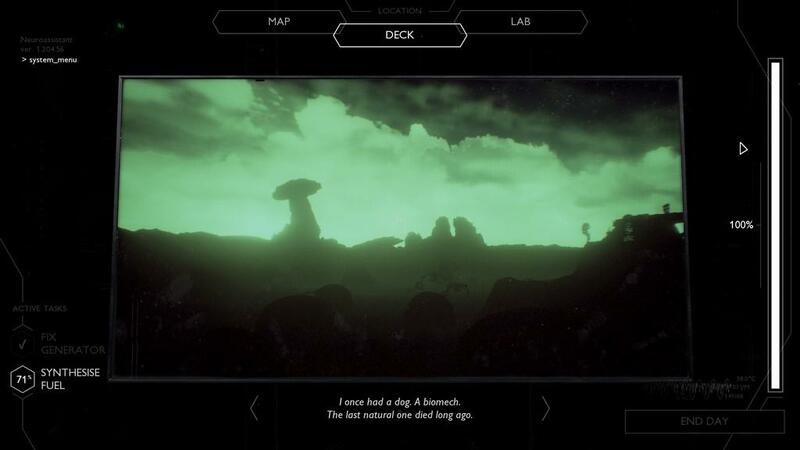 In the end what you have is a game with a nice polish that offers a little bit of driving action behind the controls of the drone, a little bit of puzzle action to synthesize the fuel, a little bit of exploring when investigating the three maps, and a little bit of narrative if you're content to click through text that loves to drop hints but is loathe to actually reveal much of anything juicy. And then it's over in about 2 or 3 hours. All it really offers is a little bit and it's done. You can grind play throughs to try and eke out a little more story, but its not told in a compelling enough fashion to really hook you in. So the question becomes, is that little bit really worth the $6.99 it's on offer for through Steam? I think the best rationalization I can come up with is that the length and cost isn't too dissimilar from what you would pay for and receive at a cinema. In that regards it just might be worth your time, but gaming usually has a much lower cost to entertainment ratio. There are plenty of games that flame out after a single play through, but they usually still offer in the tens of hours of game play first, even if they do charge a premium a few times over. And compared to some recent one-off titles with questionable length, like Firewatch, Breached might even be a bargain from a pure time-to-cost perspective. However, the critical difference is Firewatch offered a deeply compelling narrative where as Breached merely promises one and then frustrates you by obfuscating it in simple text and running you down dead ends to hunt for it. Breached was enjoyable enough for the first play through. 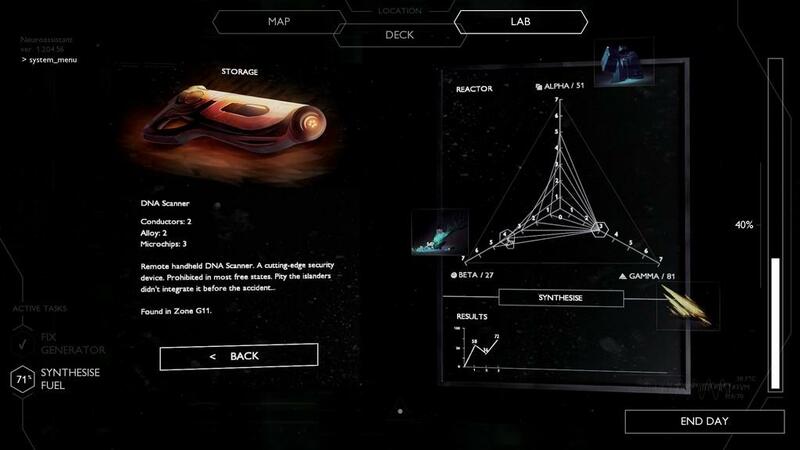 I had a decent time exploring the maps via drone, I solved a puzzle to synthesize fuel, I didn't really feel very challenged at any point, and I never felt baited to sink my teeth into the story. Is that worth 7 bucks to you? With a length about that of a major motion picture, and a price to match, is Breached worth the cost of admission? It's a game that feels like an amazing demo for a full length title that never came to be. The building blocks are there for a better game. A more compelling narrative, or one better told could have really lifted what is on offer. Breached is good and pretty. There's just simply not much of it, and it never convinced me it was worth the grind to unlock all of its secrets.